Of the many transport management companies offering services in Richmond, Virginia, and the surrounding areas, few can compare to BlueGrace Logistics. We are an award-winning third-party logistics (3PL) company providing businesses across the nation with state-of-the-art transportation services. At BlueGrace Logistics, our in-house team of engineers has designed a proprietary transportation management system that gives our clients a competitive edge. This technology, called BlueShip®, can integrate with your existing ERP, WMS, or accounting system and is fully scalable to grow with your business. Our logistics experts can use BlueShip to identify inefficiencies in your supply chain, develop a custom solution, and proactively implement it to save your business time and money. We also make BlueShip available to all of our clients, no matter how large or small their transportation needs are, so you’ll be able to access this cloud-based system whenever you need to request a freight quote, view a delivery receipt, or review an invoice. We pair our innovative transportation management technology with dedicated professionals who are highly experienced in the ins and outs of freight shipping. Whether you need assistance with full truckload shipping on a regular basis or have infrequent less-than-truckload (LTL) shipments, we can help you find the right carriers and the most efficient routes. Plus, we’ve developed strong relationships with many of the nation’s most trusted carriers, meaning we’re able to offer you some of the most competitive rates for your transport needs. 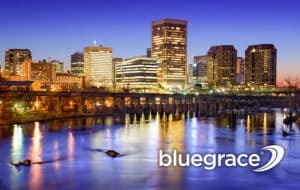 If you’d like to learn more about BlueGrace Logistics and how we stand out from other transport management companies in Richmond, VA, contact us today. We will be happy to answer your questions and provide you with a free demonstration of BlueShip.